Frequency combs are the rulers of light. By counting a wavelength’s many oscillations, they measure distance and time with extraordinary precision and speed. Since the discovery of optical frequency combs in the 1990s, many applications in metrology, spectroscopy, and frequency synthesis have emerged. Similar to the way a grandfather clock’s pendulum ticks off the seconds before signaling the gears to turn its hands, frequency combs count oscillations and convert them into useful electronic signals. Early frequency combs could only be used for wavelengths shorter than 3 microns. Measuring the 3-12 micron spectral range typically requires complex techniques that need external pumping sources and an array of other optical components. 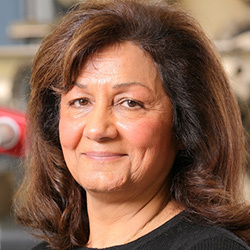 Now research led by Manijeh Razeghi at Northwestern University’s Center for Quantum Devices has overcome this technical hurdle. The group has demonstrated a room temperature, compact frequency comb based on a quantum cascade laser (QCL) with wide spectral coverage and high power. Partially supported by the National Science Foundation, Department of Homeland Security, Naval Air Systems Command, and NASA, the research was described in the February 4, 2015 issue of Applied Physics Letters. Unlike earlier frequency comb sources based on fundamentally mode-locked lasers or high-Q microresonators with intense optical pumping, Razeghi’s solution is based on QCLs and electrically pumped solid-state sources.